One of my trips to Tibet was in the late summer of 1997. A pilgrimage spot that everyone tried to talk me out of going to was the legendary Crystal Cave (Shel Drak) of Guru Rinpoche on Crystal Mountain, a key pilgrimage site for Tibetans, in particular those of the Nyingma Lineage. It is said to represent Guru Rinpoche’s Buddha attributes. After all, this was Guru Rinpoche’s first meditation cave in Tibet. It was here that he bound the demons and Bön influences under oath. Many termas were hidden and revealed here to practitioners like Orgyen Lingpa and others. I felt I had to go there. Both of the experienced Tibet trekkers that I knew said it was too hard and that neither of them had ever been there. Even our local Tibetan guide had never been there and suggested that anything that I had read suggesting that it was doable, was probably written by someone who did not know how difficult this journey is. My will to reach the Crystal Cave was not as strong after hearing this and my resolution wavered. But then we visited Traduk Temple in the Yarlung Valley, some 7 kilometers South of the city of Tsetang. As we wandered through this beautiful gompa, we came to one room with a striking gold statue of Guru Rinpoche. 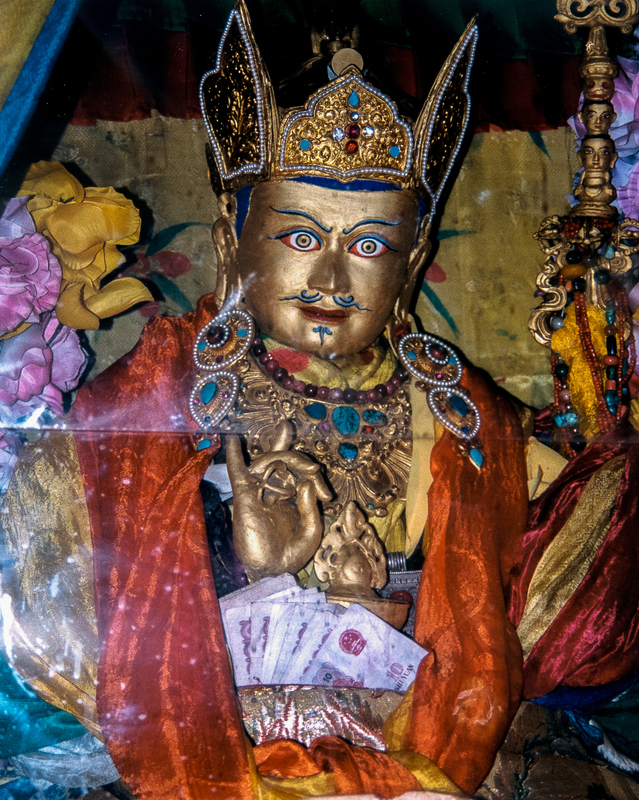 I remember reading that the original statue of Guru Rinpoche had been removed from the Crystal Cave for safekeeping and placed in a nearby monastery. This had to be it and, as the monk at the temple explained, so it was. Once I saw that statue, I knew I had to go to Crystal Cave. The story of our climb can be found here these videos.